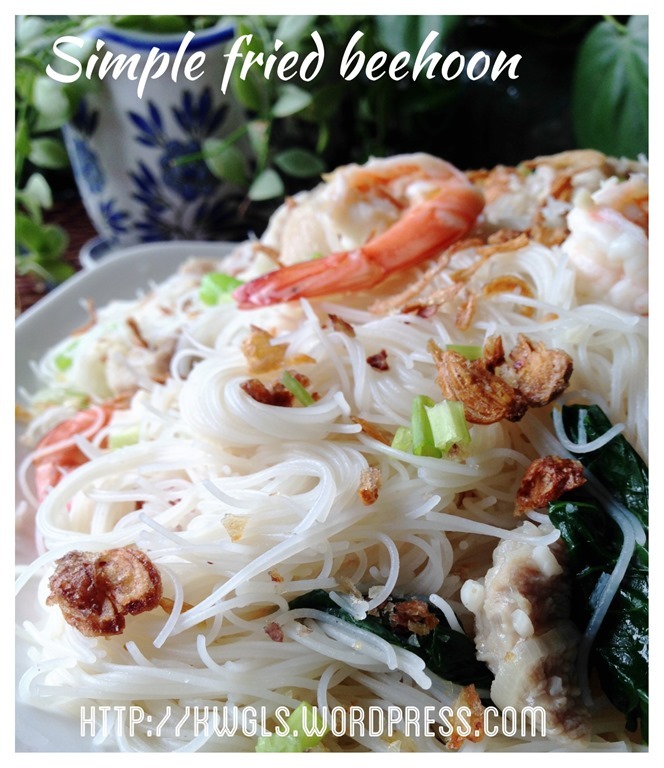 I learned the term “Fried White Bee hoon” or rice vermicelli when I started blogging and posted my food pictures in Facebook Groups.. 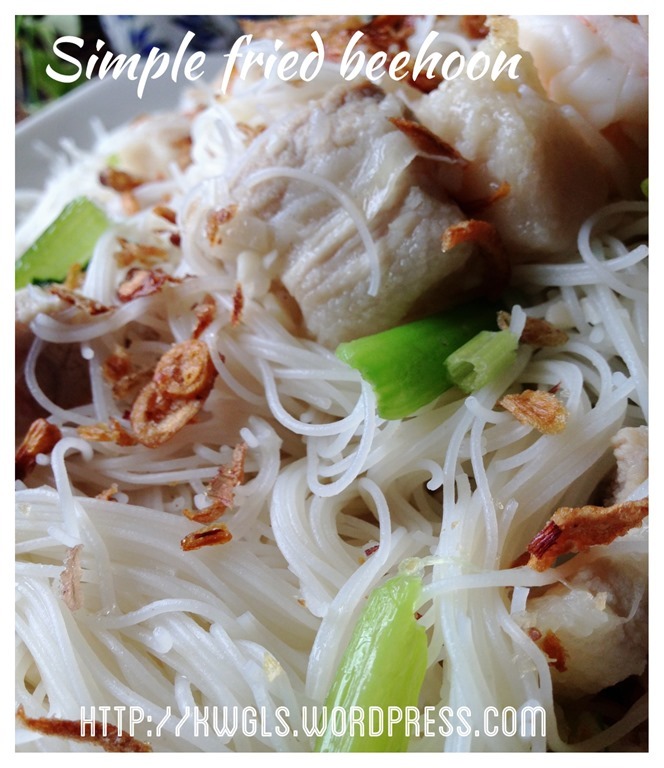 I am grumbling, is it not most fried bee hoon are white? 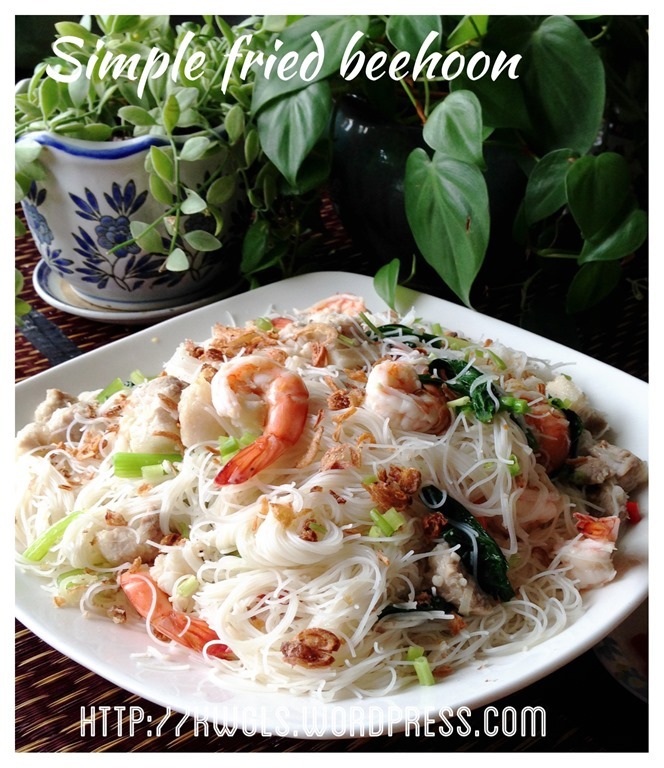 At least my late mum’s version and my mother in law’s version of fried bee hoon are all white in colour.. 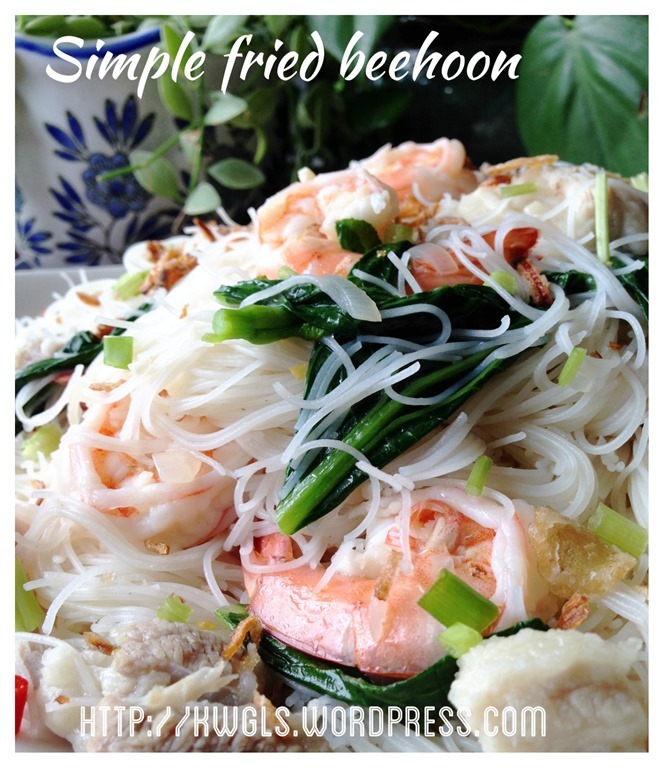 In fact, we seldom or never use soya sauce to fry the bee hoon. I take the courage of asking them why are they so “scared” of frying white bee Hoon? 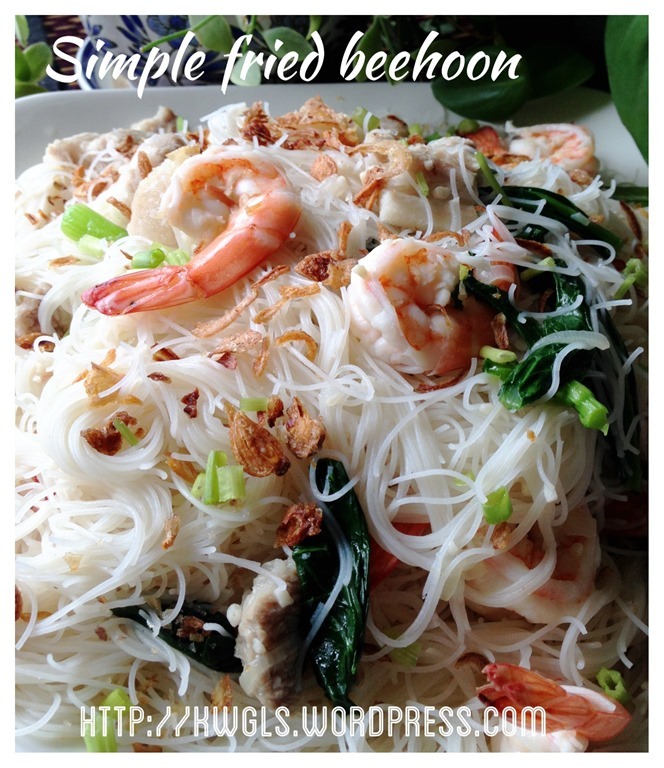 They told me that they were amazed by the fact that why white bee hoon is white and can be tasty as well… I think what they meant is why fried bee hoon without soya sauce or oyster sauce can be tasty? Well, since both soya sauce and oyster sauce are all flavouring agent, using white coloured flavouring agent will give you tasty white bee hoon..
White flavouring agent can be anything that you are using now.. Like what I am using, mushroom concentrate granules, chicken stocks cubes etc.. Others like vegetable stocks cubes and the most commonly found in the olden days will be MSG… Is it not all these are white or light coloured and make a dish tasty? Bee hoon can be rather bland.. and to get tasty bee hoon , you just need to soak the bee hoon in meat stock.. “Soak” is the word and not really “stir fry”. Stir fry too vigorously will break your bee hoon and there are members complained that it is a disaster to fry bee hoon as the broken bee hoon spilled all over the place. If you soaked your bee hoon in meat stock, it will not break unless it was soaked for too long. This recipe is my family recipe. 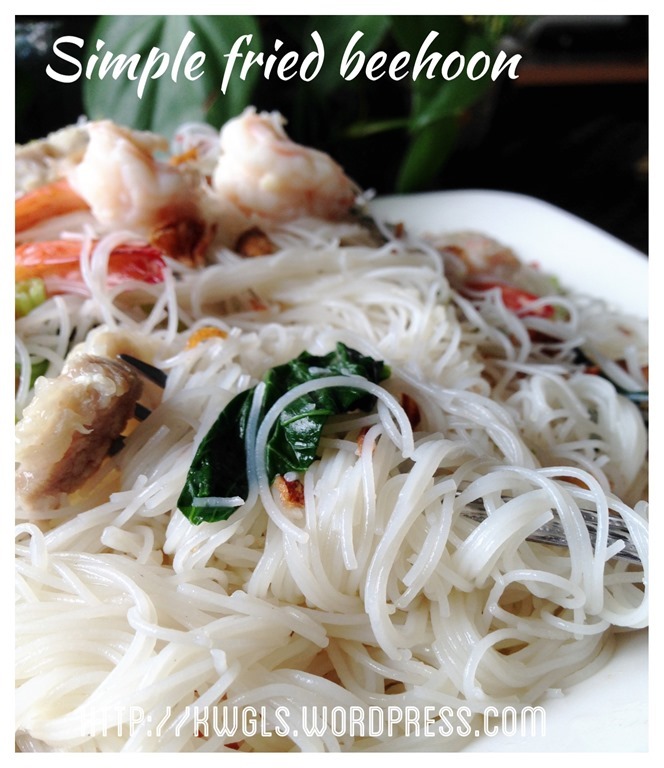 I have eaten this way of fried bee hoon since young. After I get married and when my mum passed away, I have taught my wife to cook as such. She loved it too and since than, it become the fried bee hoon for our family. 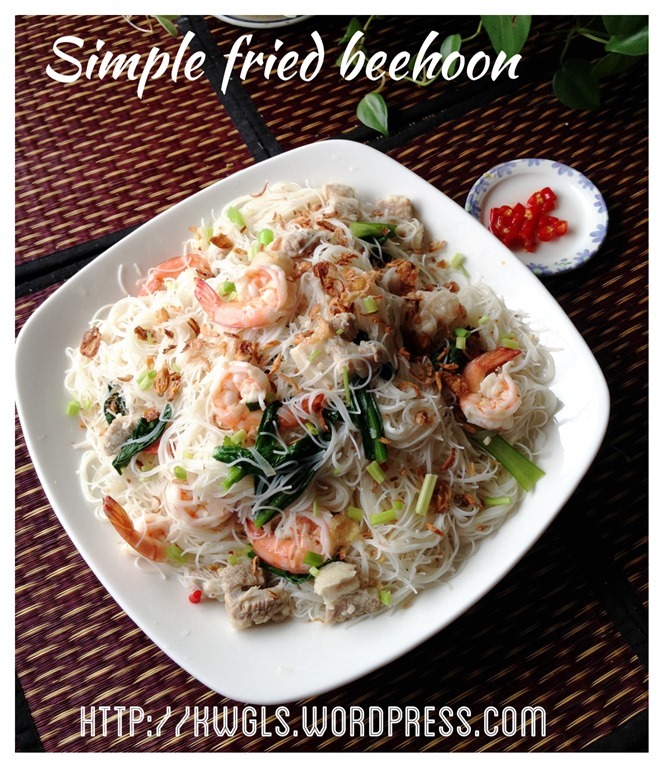 Because of this and as a respect of to my late mum, I will term this recipes as “My mum fried white bee hoon”. 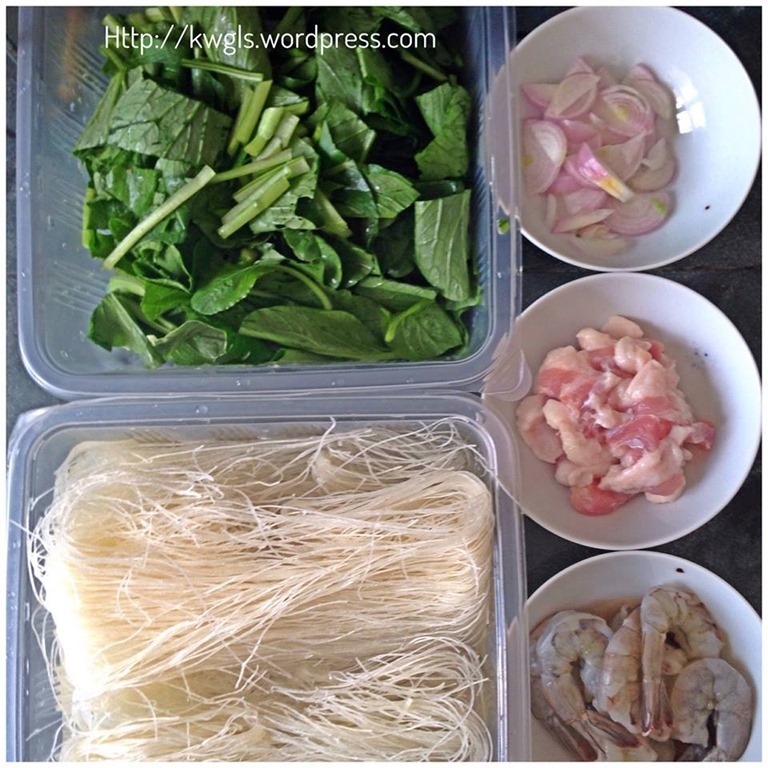 In my household cooking, we usually cooked with 3 main ingredients, no more or no less : pork belly slices, prawns and cai xin or choy sum. Of course, you can add in anything that will suit your taste bud such as eggs stripes, fish cakes, carrots etc. 1 chicken stock cubes or any other seasonings such as mushroom concentrate granules, vegetable stocks etc.. Note: Feel free to add any side ingredients that you liked such as sausage, egg omelette stripes, carrots, fish cakes and etc..
Marinate the prawns and pork slices with some corn flour and light soya sauces. 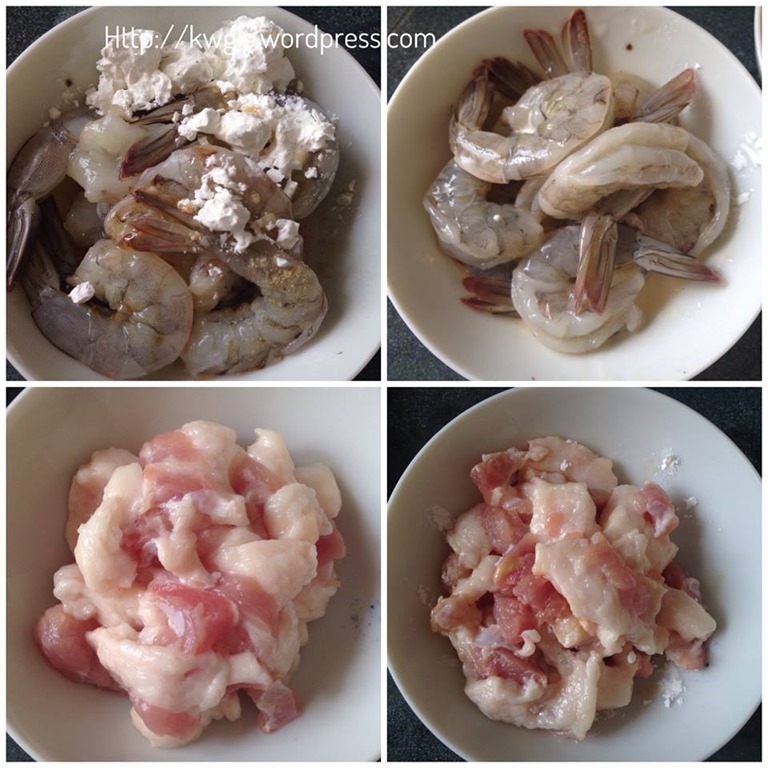 For prawns, add drops of sesame oil and dashes of white pepper. Add in water adequate to cover all the ingredients. It shall be about 1 -2 cm above all the ingredients. Let it boil for about 5 minutes. Add in seasonings: salt, white pepper, chicken stock or other flavour enhances and light soya sauce). 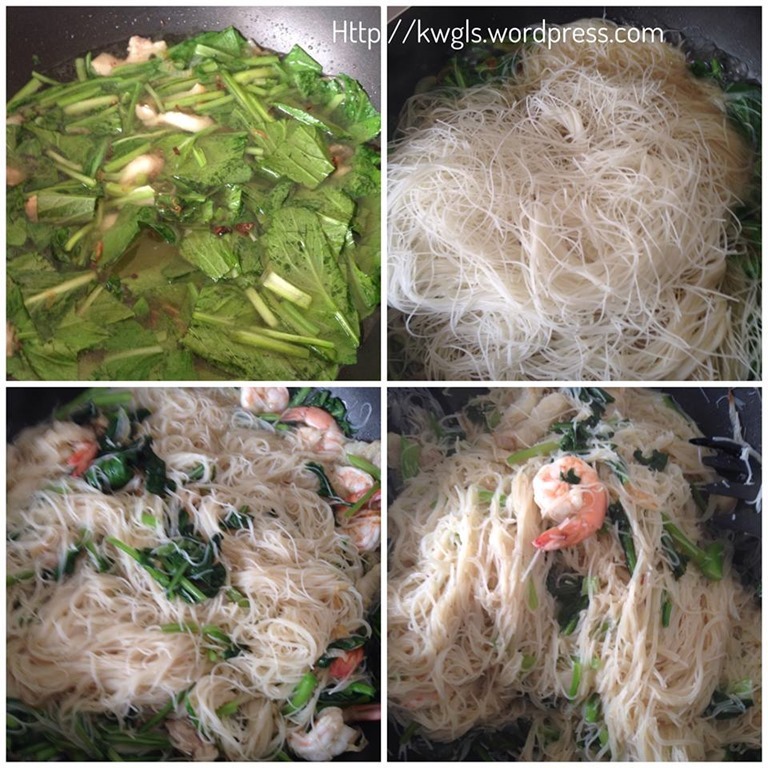 Once it boils, add the prawns and rice vermicelli and let them boil for 2-3 minutes. You will witness the water will be getting less and less and possibly dries up. Off the heat and let it rest in the frying pan for at least 5-10 minutes for the flavour to be absorbed into the rice vermicelli. If you do not use any ready made white colour stock, prepare your own fish stock or prawns stock or meat stock for soaking the bee hoon. If you like the soupy version, add slightly more stock and make a corn starch solution to the stock (about 5 tablespoons of corn starch with 10 tablespoons of water). Serve before it dries up. 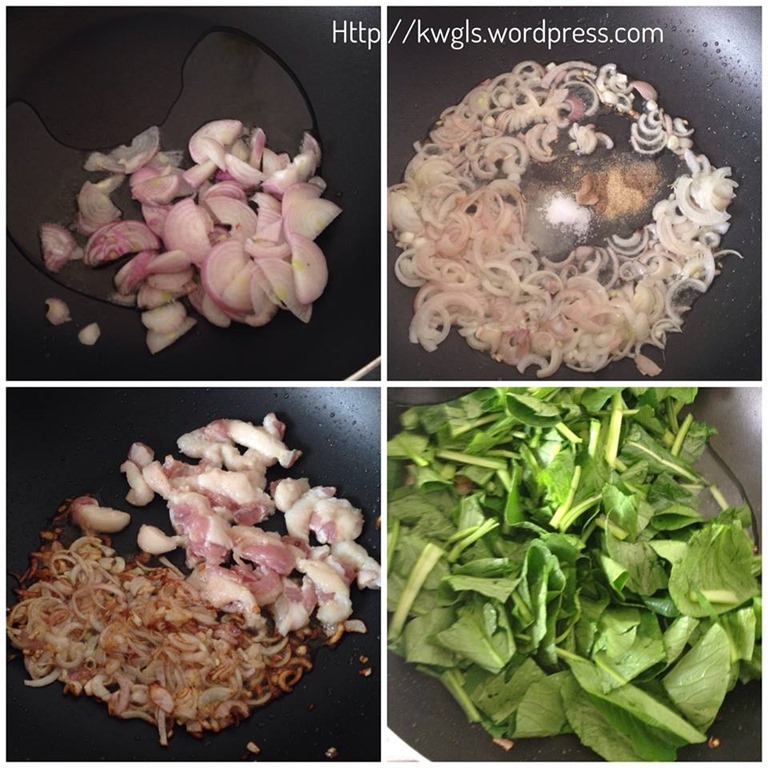 Hope this simple recipe will help new house chefs on how to stir fry the white bee hoon. There is no secret and do not be extremely concerned about the brand of the rice vermicelli. The way of cooking is the same except some may be more springy and need a bit more time to make it soft. 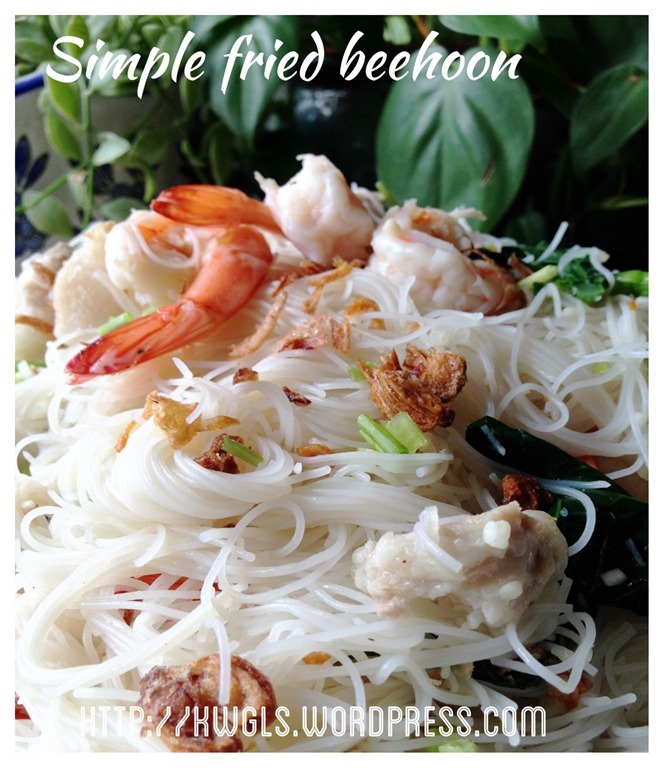 As for the colour, it is the types of seasonings that determine the colour of the fried bee hoon. 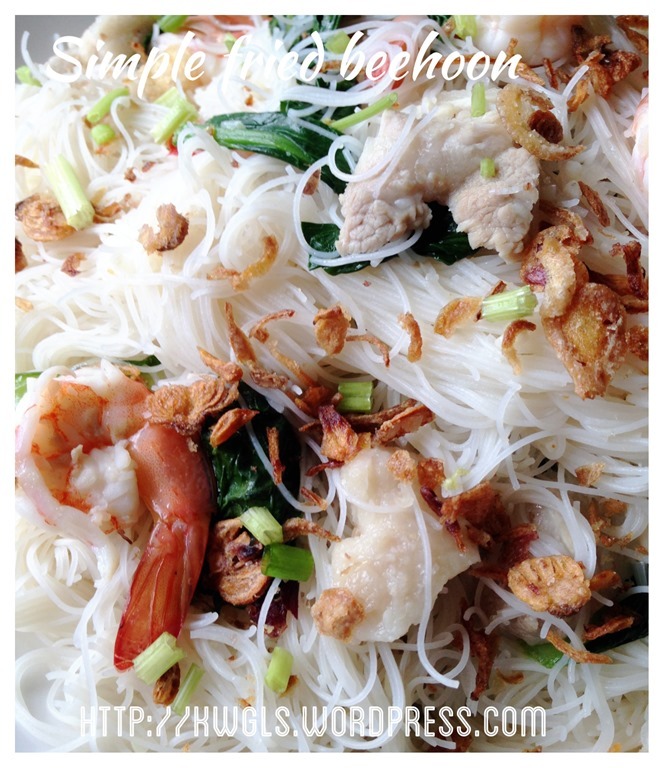 The rice vermicelli will not break if it is not overly wet.. Remember that you can add any side ingredients of your choice to please the palate of your family members. This recipe was included in Page 56-57 of the “One Pot Noodle E-book”. For more One Pot Noodle Dishes, you can have a copy of “Easy One Pot Noodles – A step by step guide” that was packed with 30 recipes, 60 pages at a reasonable convenience fee of USD5.00. The recipes covered various recipes from curry laksa, prawn noodles to fish head beehoon and etc. Of course not forgetting the well like Economy Bee hoon and Mee Rebus . You can purchase by clicking the link above.You can either pay using Pay Pal or Credit card account. Please ensure that you have an PDF reader like Acrobat or iBooks in your mobile phone or iPad if you intended to read it in your ipad or mobile phone. Should there be any problems of purchasing, feel free to contact me at kengls@singnet.com.sg and separate arrangement can be made. 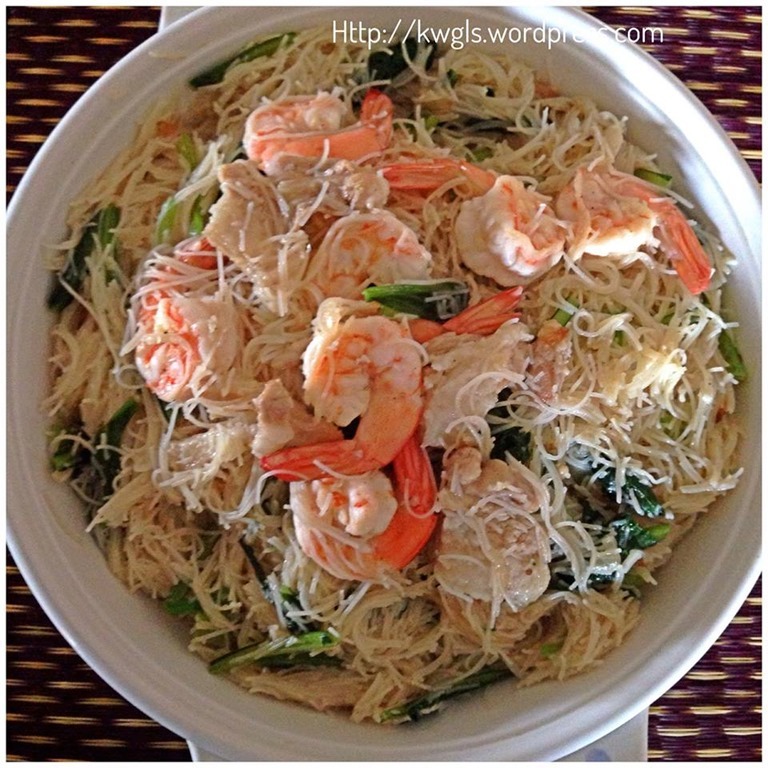 This entry was posted in Food Preparation Series, Noodles and tagged 炒白米粉， 8, fried rice vermicelli, fried white bee hoon, fried white rice vermicelli, GUAI SHU SHU, Guaishushu, kenneth goh, postaday, white bee hoon recipes. Bookmark the permalink. I like my fried bee hoon with dried prawns, tau gay (bean sprouts) and pork. Tau gay lends special aroma to the fried bee hoon. 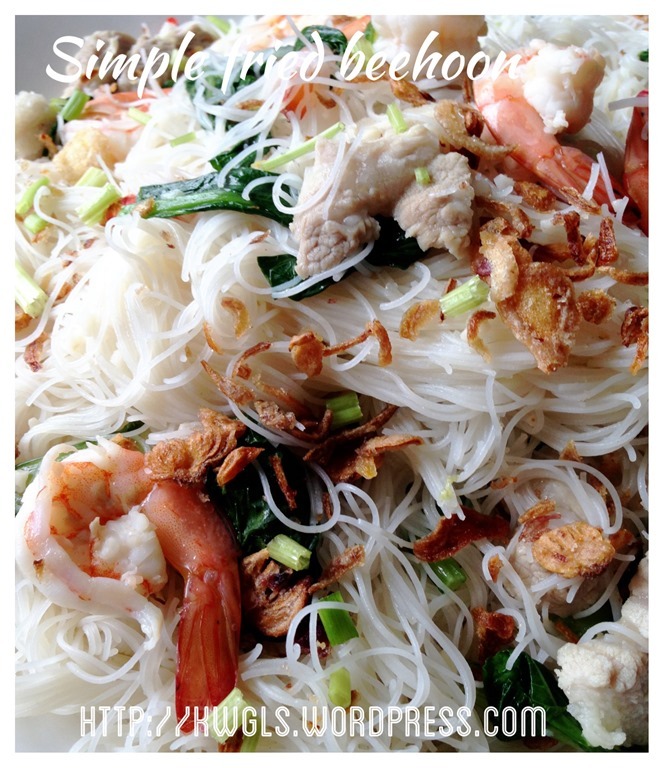 I wanted to try your family white bee hoon, but I had some question that I need to ask you. for the part: “Add in seasonings: salt, white pepper, chicken stock or other flavour enhances and light soya sauce)”, the chicken stock is chicken stock cube? if it is chicken stock, can we use the stock which we used for soaking the beehoon? so that means I will need to add salt, white pepper, chicken stock cube and light soya sauce, right? Glad you like it. REcipe is meant to be a reference ..Sure you can issue your own recipe ..
For how long do I need to soak the dried bee hoon. Hot or cold water? Is there a difference in texture when using hot or cold water. Thanks for being so generous with the recipe. Can this version still able to achieve the “wok hei” taste? Not really. Your heat at home should not be that big enough to get the wok hei.